Successful strategies must have one key element to produce spectacular results for your business ― originality. However, pure ingenuity can be hard to produce in the noise of derivative ideas and worn out processes drowning out fresh progress―which is why you need CREATIVE STRATEGY GENERATION to help guide you through tried-and-true business practices in a fresh, new, and exciting way. Bob Caporale’s diverse talents as an executive leader and a musical performer, composer, and songwriter shine through in a pitch-perfect mix of mind expanding theory and practical techniques to help you unlock the artistic strategist inside you. Whether you work in a B2B or B2C company, this proven approach can boost your strategic influence and track record, as it has for the author and the many companies he has worked with. Grounded in accessible explanations, this practical guide explores the connections between the strategic and creative processes, and demystifies the complexities of developing a strategic plan. 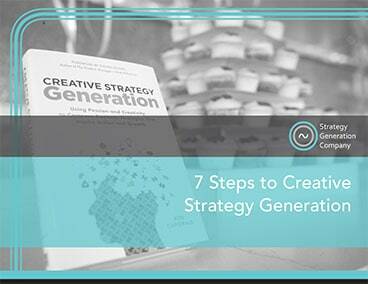 Many of the thoughts and ideas featured in Creative Strategy Generation serve as the foundation for STRATEGY GENERATION COMPANY – the strategy training and coaching company founded by Bob Caporale. STRATEGY GENERATION COMPANY offers several free tools based on the book. These include a FREE 5-PAGE GUIDE that outlines the Creative Strategy Generation process, as well as a FREE ELECTRONIC TOOLKIT containing 9 fillable templates that follow the framework outlined in the book.